– In case you missed it the Lone Wolf is now on Twitter and Blogging! Take the time to check out his stuff. Or he’ll likely kill you. – After a 3 month hiatus the fabled lost Day Camp strip surfaced from out of nowhere yesterday. 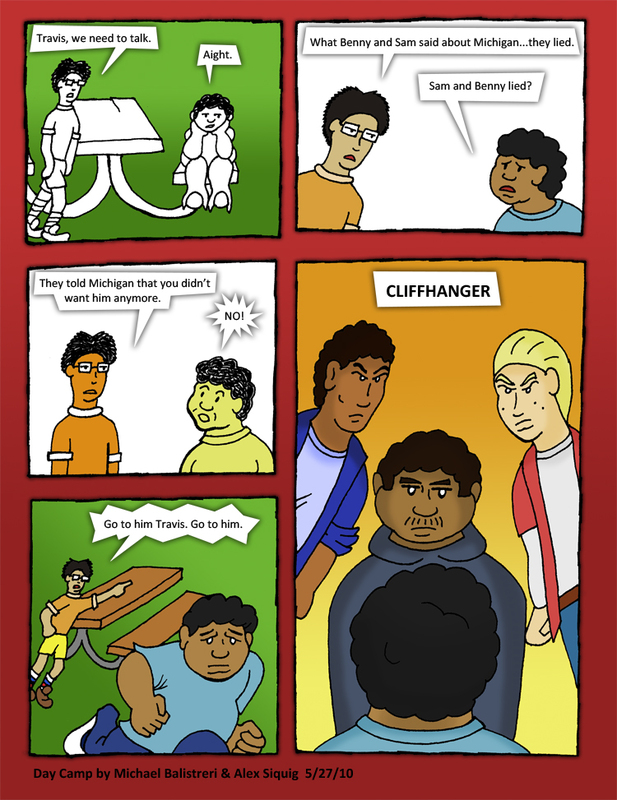 Behold “Cliffhanger”! Wow, not worth the wait. Classic Day Camp! I almost forgot how to draw it! – We have been in contact with several comic artists who are interested in working on some Black Snow Comics inspired guest art. I’m pretty excited to see what they come up with. It’s always really fun to see how someone interprets your work and adapts it to their own style to it. – Our Twitter follower count has broken the 100 barrier! If you aren’t already, please follow Black Snow Comics on Twitter for all the latest news. Oh, the Facebook fan page is slowly gaining momentum as well, so like it already. – Last Friday I posted what I feel is the funniest comic we’ve produced yet. Check out this I’M FAMOUS!, Freakshow.